Got German Genealogy? Time is short. Order today! Here is our Team! Lynell & Karl-Michael Sala have found THOUSANDS of data, documents & images for THOUSANDS of German Genealogy clients & patrons. 1st lady left: My 1stborn daughter, one of our business consultants, wife of the 1st male to the left; Paul Andrew Johnson, our webmaster who has achieved having gotten our website at the top of the Google search engine rankings; Ben Sala, computer wizard has helped me recover much lost data, is to his left; Karl-Michael Sala, husband of the 2nd lady from the left, Lynell Sala, our Research Director, Report Master & Business Manager! 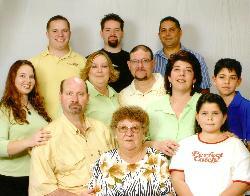 The front row lady & the fellow behind her are my mother & brother, who both succumbed to cancer, 2008 & 2006 respectively. The four persons to the far right are the in-Germany family who perform some of our research & provisional needs there. These are just some of our Teammates, who have helped get your case worked. Long story short: Were it not for some of these creative & supportive people, we would not be where we are today! Got ancestry, genealogy & family history in East Prussia (Ostpreussen), the province? With gratitude to MyHeritage.com, enjoy a Ken Burns-style slideshow of some crucial documents found for Schwellnus (Szwelnus) ancestry in Luttkomanscheit, a village within the Evangelical parish of Schakuhnen! “German Genealogy” keyword has GermanGenealogist.com sometimes as #1 in Google’s Search Engine! Check out this double-twisting back-flip video. A Most Improved German Genealogy Researcher after a 1995 Near-Death Experience. More success since then!